Rio Tinto’s Argyle pink diamonds have been combined for the first time with imperial jade in a piece of jewellery. 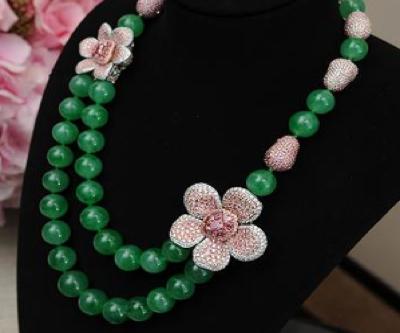 The necklace, known as The Argyle Empress, was designed by luxury jeweller Chow Tai Fook and is valued at $5.5 million. The piece, reports Diamond World, combines more than 43 carats of Argyle pink diamonds with 33 imperial jade beads. The Argyle pink diamonds include five of its signature pink tender diamonds, collected over the past five years. “The Argyle Empress is a celebration of two of the earth’s rarest treasures and is a perfect union between East and West,” Josephine Johnson, the manager of Argyle Pink Diamonds was quoted as saying. The heirloom piece of jewellery is being showcased in Hong Kong, prior to the Argyle pink diamond jewellery exhibition at Kensington Palace, in London.